Episode #373 Part III: Superman Family Comic Book Cover Dated September 1964: 80 Page Giant #3! - (7:51) SUPERBOY'S MOST AMAZING DREAM (12 pgs. ), written by Otto Binder, pencilled by Curt Swan and inked by Stan Kaye. This story was the first of three stories published in ADVENTURE COMICS 211, April 1955, published around February 24, 1955. - (25:39) THE GIRL WHO STOLE SUPERMAN (9 pgs), writer unknown according to Mike's Amazing World Of DC Comics, while both the Grand Comic Book Database and Comic Book Database.com credit Jerry Coleman as the writer. Kurt Schaffenberger was the artist. It was the third and final story printed in SUPERMAN'S GIRL FRIEND LOIS LANE 7, February 1959, published around December 24, 1958. We first covered this story in Episode 266 for the week of April 24, 2013. It was also reprinted in SHOWCASE PRESENTS: SUPERMAN FAMILY vol. II and SUPERMAN'S GIRL FRIEND LOIS LANE ARCHIVES vol. I. - (36:32) THE FLYING GIRL OF SMALLVILLE (7 pgs. ), written by Jerry Coleman and drawn by Craig Flessel. This story appeared as the third and final story in SUPERBOY 72, April 1959, published on February 19, 1959. - (51:05) LANA LANG, SUPERWOMAN (9 pgs. ), writer unknown according to Mike's Amazing World Of DC Comics, while the Grand Comic Book Database and Comic Book Database.com credit Jerry Siegel as the writer. Curt Swan was the penciller and Stan Kaye was the inker. It was the second of three stories which first appeared in SUPERMAN'S GIRL FRIEND LOIS LANE 17, May 1960, published on March 24, 1960. We first covered this story back in Episode 301 Part II for the week of September 7, 2014. - (1:06:37) THE BATTLE BETWEEN SUPER-LOIS AND SUPER-LANA (9 pgs. ), writer unknown according to Mike's Amazing World Of DC Comics, while both the Grand Comic Book Database and Comic Book Database.com credit Jerry Siegel as the writer. The artist was Kurt Schaffenberger. This story was the second and final story published in SUPERMAN'S GIRL FRIEND LOIS LANE 21, November 1960, released on September 22, 1960. We covered this story in Episode 314 Part II for the week of February 4, 2015. - (1:21:38) MR. AND MRS. CLARK (SUPERMAN) KENT (8 pgs. ), written by Jerry Siegel and drawn by Kurt Schaffenberger. This was his 98th silver age Superman Family story, and his 143rd for the era. It was originally published as the third and final story in SUPERMAN'S GIRL FRIEND LOIS LANE 19, August 1960, released around June 28, 1960. It carried the sub-heading, THE 1ST OF AN IMAGINARY SERIES, what came to be known as Imaginary Stories. We originally covered this story in Episode 307 Part II for the week of November 12, 2014. 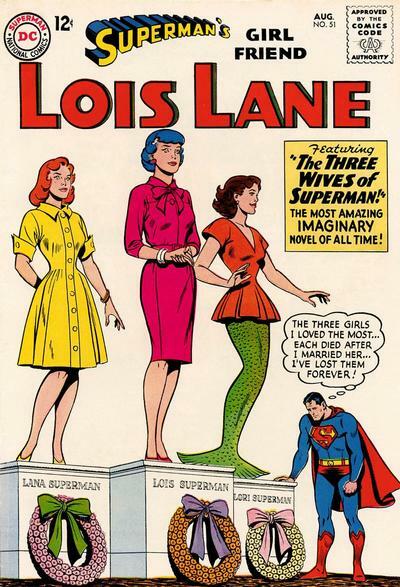 - (1:39:35) THE DAY SUPERMAN MARRIED LANA LANG (9 pgs. ), writer unknown according to Mike's Amazing World Of DC Comics, while the Grand Comic Book Database and Comic Book Database.com credit Jerry Siegel as the writer. Kurt Schaffenberger was the artist. This story was the first of three stories in SUPERMAN'S GIRL FRIEND LOIS LANE 26, July 1961, originally published on May 11, 1961.We first covered this story in Episode 331 Part I for the week of December 9, 2015. - (1:54:31) SUPERMAN'S GREATEST SACRIFICE (9 pgs. ), writer unknown according to Mike's Amazing World Of DC Comics, while the Grand Comic Book Database and Comic Book Database.com credit Robert Bernstein as the writer. Kurt Schaffenberger was the artist. It was the first of three stories originally released in SUPEeRMAN'S GIRL FRIEND LOIS LANE 5, November/December 1958, published around September 16, 1958. We covered this story first in Episode 254 for the week of January 2, 2013. - (2:10:24) LOIS LANE'S ROMEO (8 pgs. ), writer unknown according to Mike's Amazing World Of DC Comics, while the Grand Comic Book Database and Comic Book Database.com credit Robert Bernstein as the writer. The artist was Kurt Schaffenberger. This was the second of three stories published in SUPERMAN'S GIRL FRIEND LOIS LANE 10, July 1959, released on May 14, 1959. We first covered this story in Episode 279 for the week of August 28, 2013. 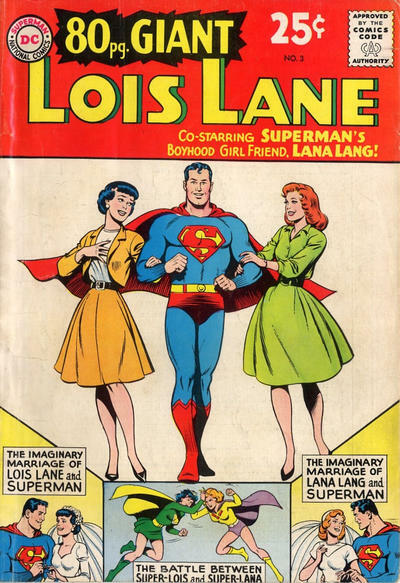 Also highlighted in this episode are the issue's ads and other features, including the text articles, FAMOUS OLD LANA LANG STORIES, LOIS LANE'S INTERPLANETARY ADVENTURES, WHEN SUPERMAN KISSED LOIS LANE, LOIS LANE'S ROMANCES and LANA LANG'S ROMANCES. We will finish looking at the Superman Family cover dated September 1964 with: PART IV: WORLD'S FINEST COMICS 144 & PART V: ACTION COMICS 316. Stay safe during this last week of holiday shopping and don't forget to take care of each other out there! Episode #373 Part I: Superman Family Comic Book Cover Dated September 1964: 80 Page Giant #2 (Starring Jimmy Olsen)! 80 Page Giant 2 (starring Jimmy Olsen), September 1964! Download Episode 373 Part I! 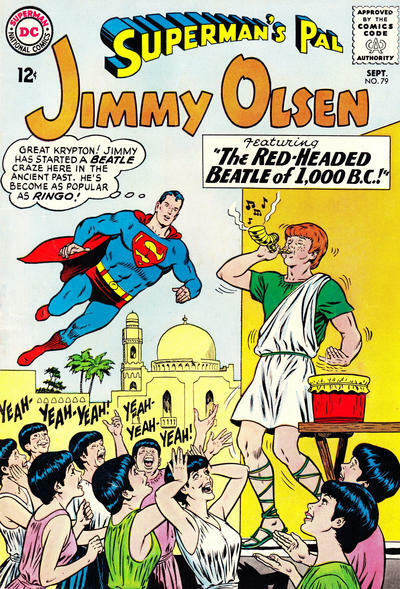 80 PAGE GIANT 2, starring Jimmy Olsen, September 1964, was published around June 18, 1964. It contained 80 pages for the cover price of 12¢. Mort Weisinger was the editor, and the cover was pencilled by Curt Swan and inked by George Klein. - (15:12) THE WAR BETWEEN SUPERMAN AND JIMMY OLSEN (12 pgs. ), was written by Alvin Schwartz, pencilled by Curt Swan and inked by George Klein. This story was the first one published in ACTION COMICS 253, June 1959, released on April 30, 1959. This issue was first covered in Episode 190, for the week of August 3, 2011. The story was also reprinted in BEST OF DC 16, September 1981, published on June 4, 1981, SHOWCASE PRESENTS: SUPERMAN vol. I, and SUPERMAN: THE MAN OF TOMORROW ARCHIVES vol. II. - (26:52) THE E-L-A-S-T-I-C LAD (8 pgs. ), was written by Otto Binder, pencilled by Curt Swan and inked by Ray Burnley. This story was the first one printed in SUPERMAN'S PAL JIMMY OLSEN 31, September 1958, published around July 15, 1958. It was reprinted in SUPERMAN: THE AMAZING TRANSFORMATIONS OF JIMMY OLSEN and SHOWCASE PRESENTS: SUPERMAN FAMILY vol. II. We first covered this story in Episode 249 for the week of November 21, 2012. - (36:22) THE JIMMY OLSEN FROM JUPITER (10 pgs. ), written by Alvin Schwartz, pencilled by Curt Swan and inked by Ray Burnley. This story was the third one in SUPERMAN'S PAL JIMMY OLSEN 32, October 1958, published around August 21, 1958. We first covered this story in Episode 251 for the week of December 12, 2012. - (50:23) THE SUPER NOSE FOR NEWS (8 pgs. ), was written by Otto Binder, pencilled by Curt Swan and inked by Ray Burnley. It was the first one in SUPERMAN'S PAL JIMMY OLSEN 32, October 1958, published around August 21, 1958. We first covered this story in Episode 251 for the week of December 12, 2012. - (1:04:23) THE MC OF THE MIDNIGHT SCARE THEATER (9 pgs. ), was written by Robert Bernstein, pencilled by Curt Swan and inked by John Forte. This was the first story in SUPERMAN'S PAL JIMMY OLSEN 38, July 1959, published on May 21, 1959. It was reprinted in SHOWCASE PRESENTS: SUPERMAN FAMILY vol. III. We first covered this story in Episode 279 for the week of August 28, 2013. - (1:18:56) THE HUMAN SKYSCRAPER (8 pgs. ), written by Otto Binder, pencilled by Curt Swan and inked by Ray Burnley. It was the third story in SUPERMAN'S PAL JIMMY OLSEN 28, April 1958, published around February 25, 1958. We first covered this story in Episode 239 for the week of September 12, 2012. - (1:28:08) THE HUMAN FLAME-THROWER (8 pgs. ), written by Otto Binder, pencilled by Curt Swan and inked by Ray Burnley. It was the final story in SUPERMAN'S PAL JIMMY OLSEN 33, December 1958, published around October 7, 1958. This story was also reprinted in SUPERMAN: THE STRANGE TRANSFORMATIONS OF JIMMY OLSEN and SHOWCASE PRESENTS: SUPERMAN FAMILY vol. II. We first covered this story in Episode 256 for the week of January 31, 2013. - (1:39:30) THE SON OF SUPERMAN (8 pgs. ), written by Otto Binder, pencilled by Curt Swan and inked by Ray Burnley. This story was the first one in SUPERMAN'S PAL JIMMY OLSEN 30, August 1958, published around June 5, 1958. It was also reprinted in SHOWCASE PRESENTS: SUPERMAN FAMILY vol. II. We first covered this story in Episode 247 for the week of November 7, 2012. 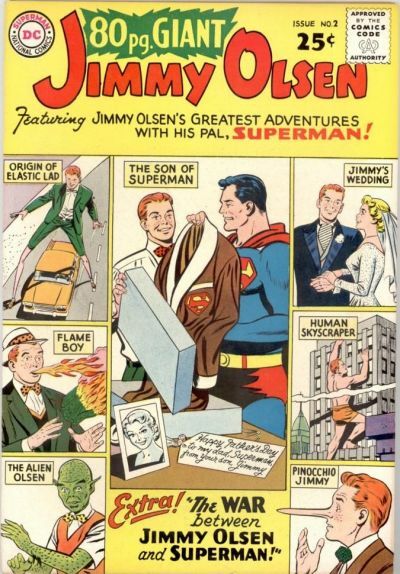 - (1:50:03) JIMMY OLSEN'S WEDDING (9 pgs. ), was written by Robert Bernstein, pencilled by Curt Swan and inked by John Forte. This story was the second one released in SUPERMAN'S PAL JIMMY OLSEN 38, July 1959, published on May 21, 1959. We first covered this story in Episode 279 for the week of August 28, 2013. During this episode we also cover the issue's ads and other features, including some short text articles about some of Jimmy Olsen's friends and adventures. Next episodes we will finish: SUPERMAN FAMILY COMIC BOOKS COVER DATED SEPTEMBER 1964: PART II: SUPERMAN'S PAL JIMMY OLSEN 79, PART III: 80 PAGE GIANT 3 (featuring Lois Lane and co-starring Lana Lang), PART IV: WORLD'S FINEST COMICS 144 & PART V: ACTION COMICS 316! Episode #372 Part V: Superman Family Comic Book Cover Dated August 1964: Superman's Girl Friend Lois Lane #51! Superman's Girl Friend Lois Lane 51, August 1964! SUPERMAN'S GIRL FRIEND LOIS LANE 51, August 1964, was published around June 25, 1964. It contained 32 pages for the cover price of 12¢. The editor was Mort Weisinger, and the cover was drawn by Kurt Schaffenberger and lettered by Ira Schnapp. - (8:17) PART I: THE TERRIBLE SECRET OF MRS. LOIS SUPERMAN (9 pgs.). - (24:25) PART II: THE TRAGIC TORMENT OF MRS. LANA SUPERMAN (9 pgs.). - (37:42) PART III: THE SHOCKING FATE OF MRS. LORI SUPERMAN (7 pgs.). Also highlighted in this episode are the issue's ads and other features, including the short text article, THE MANY LIVES OF LOIS LANE. Next Episodes: SUPERMAN COMIC BOOKS COVER DATED SEPTEMBER 1964: PART I: 80 PAGE GIANT 2 (starring Jimmy Olsen), PART II: SUPERMAN'S PAL JIMMY OLSEN 79, PART III: 80 PAGE GIANT 3 (featuring Lois Lane and co-starring Lana Lang), PART IV: WORLD'S FINEST COMICS 144 & PART V: ACTION COMICS 316!